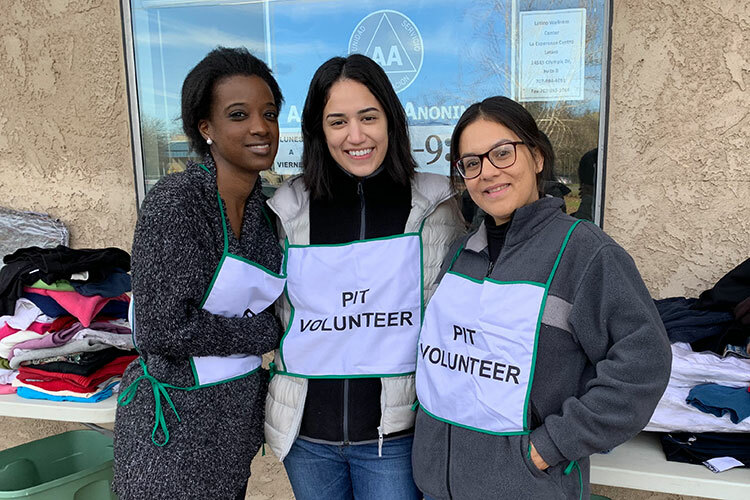 In late January 2019, several PUC classes assisted local agencies with a government-required Point In Time (PIT) count of the homeless in Clearlake, California. Students in Human Behavior in the Social Environment developed their basic client assessment skills; those in Program Evaluation conducted research on an existing community program; and students in Statistical Methods studied how statistics can provide insight into local communities and play a role in securing and directing resources. The Principles of Counseling class was invited to take part for hands-on experience. According to Mantz, in 2018, Lake County reported 615 homeless persons to Housing and Urban Development (HUD), the federal entity which requires the PIT count. Of those 615, 591 were unsheltered due to a lack of emergency or temporary shelter in Lake County. As the students surveyed people experiencing homelessness, Mantz says they heard stories about individuals and families losing their homes to the fires which have ravaged Lake County over several years. The students suggested collecting additional data about those whose homes were lost in order for the county to apply for funding. Tajh Rolle, a social work pre-nutrition and health sciences major, was among the students who participated in the count. She says the experience helped solidify concepts they were learning in class, such as Maslow’s Hierarchy of Needs, which states humans focus on taking care of their basic human needs before worrying about things like morality. Mantz explains funding comes into the county from the federal government based on the information gathered by the PIT count, and is used to support local resources including transitional housing, emergency shelter, rapid re-housing, and other services to meet people’s basic needs. Students in Program Evaluation will be working with the Lake County Continuum of Care to input the raw data from the count and do data analysis. Those in Statistical Methods will reflect on the data gathered and the implications of data analysis on future PIT count survey questions and methods. Rolle believes the issue of homelessness doesn’t get as much attention as it deserves because there are really no easy solutions. But, she adds, that doesn’t mean we shouldn’t talk about it or try to understand those experiencing homelessness. For information on service opportunities available at PUC, contact Mantz at cmantz@puc.edu; Fabio Maia, service & missions coordinator, at fmaia@puc.edu or (707) 965-7120; or reach out to this year’s student leaders by contacting SA President Kenzie Hardy at knhardy@puc.edu.